My name is Tony. I'm a graduate student at SUNY Albany persuing a Ph.D. in physics. I started my fishkeeping obsession my Sophomore year of undergrad. It began with a 10 gallon betta planted aquarium and quickly infected the rest of my residence. 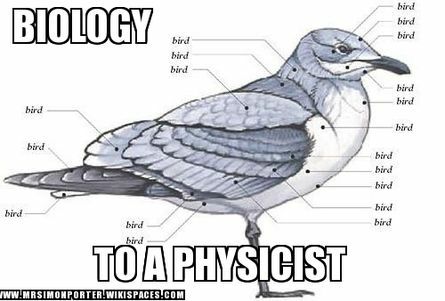 My biology is rudimentary but I love blending my knowledge of physics and chemistry with the unknowns of biology. I have my most experience keeping African cichlids. Over the past couple years I've grown up a fairly prolific breeding colony of Labidochromis caeruleus (Yellow Lab Cichlids). They breed like rabbits and the parenting behavior of cichlids is so much fun to watch. One of my other favorite things about this hobby is it blends science with art. I'm not an artistic person but I do get to experiment with some creative projects through aquariums. A few years ago I built an underwater LED volcano. I used a 555 timer, red and yellow LEDs, and a potentiometer to dial in various frequencies of the flashing light. It really looked like magma bubbling up from under the rockwork. Another fun project involved building a foam and concrete background/aquascape for my 55G African cichlid tank. That made a HUGE mess but boy was it a fun project. Here are some FTS of my aquariums (they're all at least a couple months old but you get the idea). Inhabitants: Metriaclima elongatus (sp. Chewere and sp. 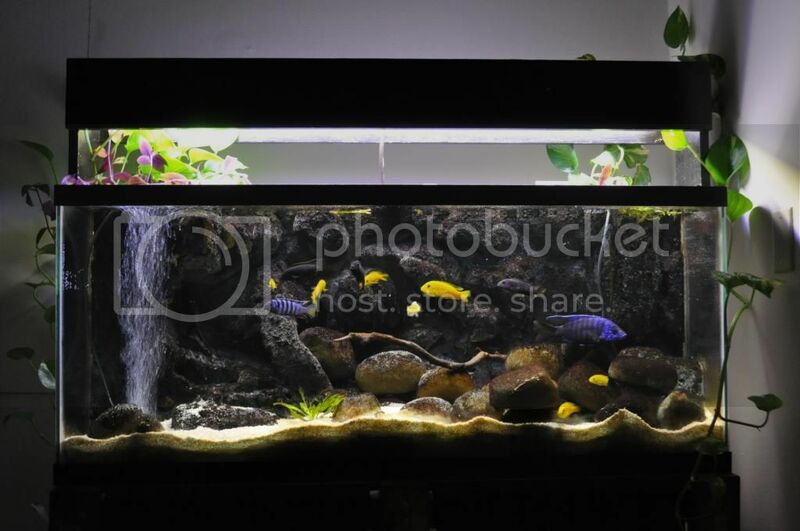 Mphanga), Labidochromis Caeruleus, Synodontis eupterus, and an Aulonocara. This photo is about a year old and the stocking has changed but the idea is still there. Last summer I put together my first monster tank. The dominant fish are a pair of Hypselecara temporalis (Chocolate cichlid), backing them up are some likely soon to be too large Vieja synplisum, Heros severums (GORGEOUS! ), Geophagus 'Red Head Tapajos', a tire-track eel (not a SA cichlid), and a couple bichirs (also not a SA cichlid). As these fishes mature I'll likely have to thin down the stocking. For the interested viewer I composed a video series about what I did to put this aquarium together. I've dabbled a little bit in some Asian and subcontinent species, explored some mbuna of Lake Malawi, and poked around the Amazonian tributaries. I think it's about time I try learning a bit about more local ecosystems. 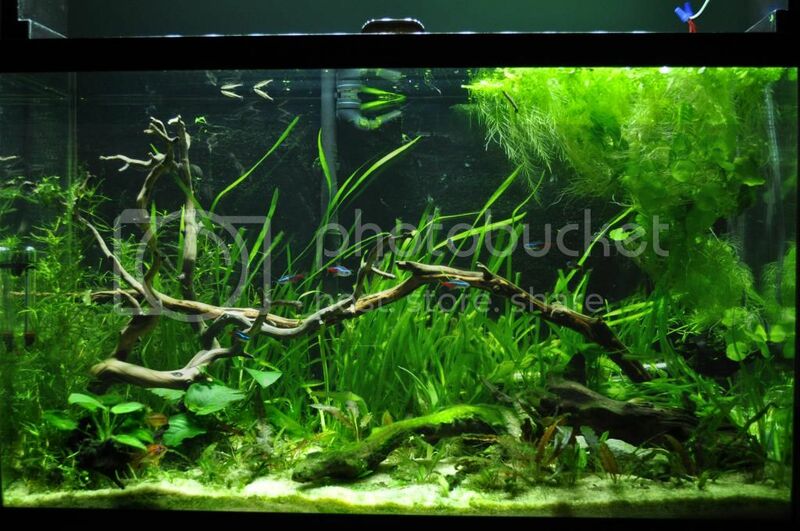 I've been considering changing the 55G aquarium for about a year now. Yellow labs are great but I want a change of pace. Was considering trying some other African species but then I thought to come home. why not texas cichlid , rare ,native, large, ? That's exactly what I'm thinking. Sunfish have some great colors and, from the roumors, some feisty personalities. I'm considering some pumpkinseeds but also love the Dollar Sunfish and Redears. 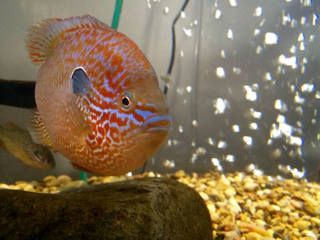 Texas cichlids are brutes! I was considering going with a wet pet when I originally set up the 135G but decided I'd rather have quantity over size. I would have gone with a Cichlasoma festae. Those guys are gorgeous! I wanted the possibility to breed and didn't have a backup tank available for breeding festae (and I didn't want to partition my display tank). Ditto on the longears. Redear would be a little big for a 55. For my money, you can't do much better than the Missouri strain of longear. I still think it's interesting that there are many color morphs of the same species here in the US. I know it happens everywhere (my biggest experience with it is in Lake Malawi mbuna) but it's still strange to think. Biology man....! I just wish I was as artistic as you and a lot of the other members here seem to be. 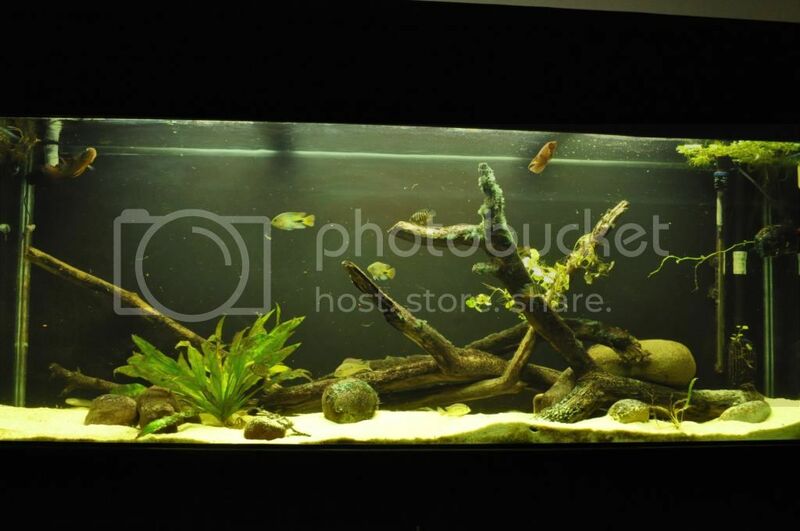 If you ever get on YouTube, look up username Native Fish Keepers (Mr Catfish, I believe, on the NANFA forum) and take a look at his stream tank. It's about the coolest thing I've ever seen. I'm glad you brought that up. I was actually poking around at some of his videos just last night. I thought his stream tank was incredibly intersting. Too bad it broke (but glad he got an upgrade out of it). I honestly wouldn't say I'm artistic. I don't have the patience for it most of the time. It's fun to build things but making them pretty is tricky. Bummer. I was impressed with that tank as well. Guess the rock weight did it in. Not common, but without some substrate under the heavy rock, and the thinner glass of a 20 gallon, I guess it was just too much. Tempered glass bottom breaks, and it is not just a crack, it is a million cracks. It likely created a pressure point. There is quite a bit of mass with all that sand and rock. I'm looking forward to the new tank though! On another note I took an hour today to go outside (that's a big step for a physics major). We don't get outside nearly often enough. Plus, this winter was way too cold for hiking. I went down to the pond with a couple of friends and tossed a line for about an hour. Didn't catch anything (and didn't even get any nibbles) but I did see a couple of sunnies of some sort for about 5 seconds when I first walked up. At least I know they're in there. I'm keeping my eye on CL to see if there's a nice tank coming available. I'd love to go for something in the 125 range. If I did I'd replace the tank in my room. If not I'm still looking out for a 75/90 (although I'm hesitant to go with a heavier 4' tank if I can't lay it across multiple joists). I really love the 18" width of my 135G. The extra space makes a huge difference. I am done with my exams and would like to get wet! Please let me know if anyone is going on any excursions in the upstate New York/Adirondacks area.